While we're constantly writing about innovative new prototypes, it's rare that we actually get to see how these designs come to life. But this past weekend we spent two days in a warehouse at Carnegie Mellon University in Pittsburgh doing just that. We watched some of the most talented designers and creative engineers from CMU and Deeplocal work with the winners of Toyota's Ideas for Good challenge to adapt Toyota technologies to build entirely new products that could make the world a better place. It was an incredibly exciting and inspiring weekend, and we had a ton of fun watching the engineers in their element. Hit jump to see some of the rapid prototyping for yourself! Toyota’s Ideas for Good challenge began just seven months ago when the company opened up five of its most innovative technologies and asked people to come up with ways they could be used outside of cars. They received nearly 10,000 submissions, 4,300 of which qualified for the competition. Then the public cast 19,000 votes, and a team of experts chose 25 finalists and five winners. The team of experts included Wired Associate Publisher Keith Grossman; Joel Stitzel, Ph.D., a biomedical engineer at Wake Forest University Biomedical Center; Jacob Ward, the West Coast Bureau Chief at Popular Science; designer and entrepreneur Grace Hawthorne, a consulting associate professor at the Hasso Plattner Institute of Design at Stanford; and Josh Morenstein, the creative director at fuseproject. Over the weekend, the experts worked with the winners, creative engineers and designers from Deeplocal, and engineers from Toyota to make working prototypes of the the five winning ideas. And the ideas were really just that — ideas. The winners are not designers by trade, so it was amazing to watch the insanely talented team at Deeplocal turn them into reality. 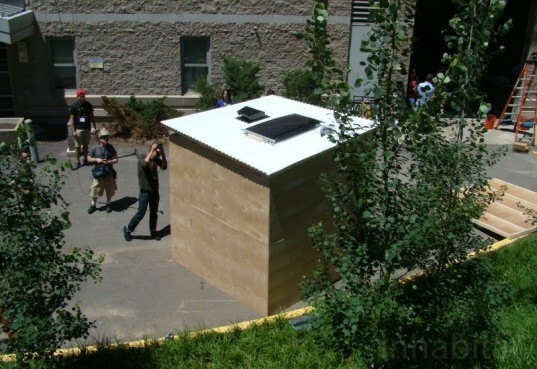 One of the most exciting projects was using the Prius’s solar powered ventilation to create a clean air system for homes in developing countries where people still cook over open fires indoors. 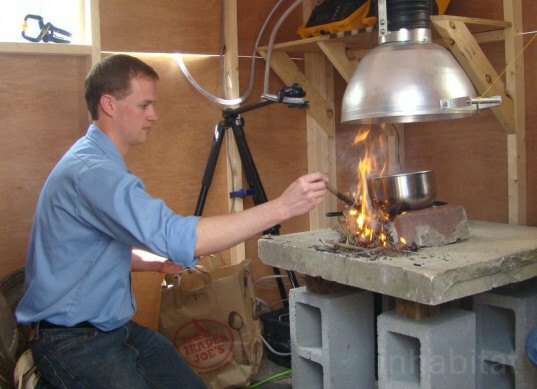 While Toyota uses the technology to cool the inside of a car, Tim Witmer came up with the idea to use it to help clean the air inside small homes where people use open fires. Another design that has real potential to come to the market is the better bike helmet, concocted by Stu Selthun. 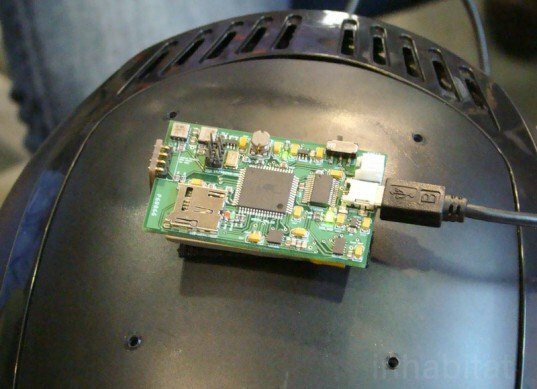 Stu’s team didn’t create a new bike helmet in three days, but they did design a data collecting device that could pave the way for a better bike helmet. Stu’s expert was Dr. Joel Stitzel, the man behind the recent football helmet safety research. Josh Schapiro, a CMU professor that worked with Deeplocal, created a small data collector with two circuit boards and five different sensors that measure different types of acceleration and force. They attached the sensor pack to a helmet and did a variety of drop tests, then compared that data to data that Dr. Stitzel had run through Toyota’s T.H.U.M.S. software. The idea behind the pack is that it could be manufactured and sold to bikers, who could attach it to their own helmets. If they crash, the sensor would blink or send information to their phone letting them know whether or not they need to go to the hospital. The data collected from these real life crashes could also ultimately be used to design a better bike helmet. Most of the electricity generating exercise equipment that we see comes in the form of cardio machines. But to make 20-year-old Birken Schimpff’s idea of the power plant gym a reality, the team went a different route. They bought a weight machine, but left the weights off when they built it. Instead, they attached a bicycle wheel and custom made an adjustable handle to change the resistance. By changing the vertical motion of the weights into a circular motion, they were able to convert that energy into power; much like Toyota’s hybrid synergy drive technology converts the energy from breaking into electricity. 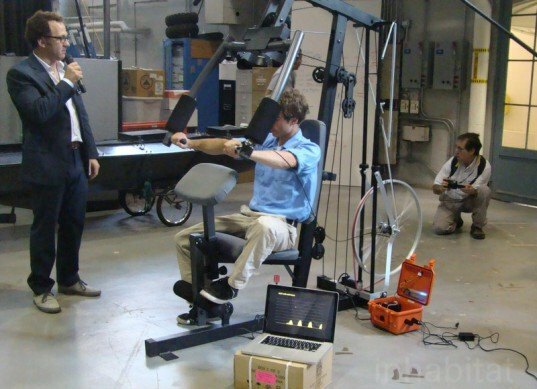 While the system could not power the lights in the gym, it could be used to power things the person on the machine uses while they work out, like the TV or their iPod. 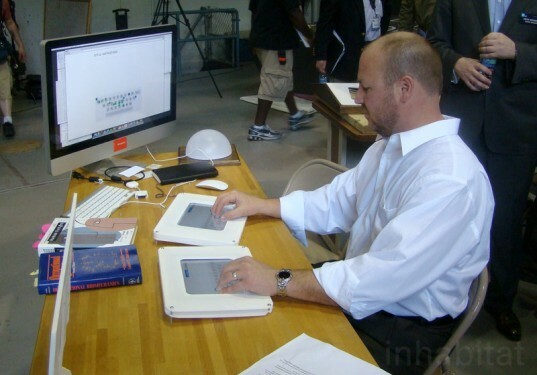 The fifth and final prototype created was a customizable touch screen keyboard, invented by David Champion. Using a system similar to Toyota’s touch tracer technology, Deeplocal engineers designed an app-based system that includes a keyboard, mouse, and any other input that you might want. Two moveable touch screens were used so the user maintains full control. When your hands are on the touch keyboard, a pop-up image regular QWERTY keyboard appears on your monitor showing exactly where your fingers are. No more hand cramps or looking down at your keyboard to find the right keys. All of the winning ideas, plus the other 20 finalists, now belong to CMU and, if they want, the creators can work with the university on their continued development. Toyota donated $100,000 to CMU to help keep the projects going. The weekend was incredibly inspiring, not just because people were making green designs right before our eyes, but because a major corporation like Toyota opened its technologies for other people to use. We hope that more companies follow suit, and allow designers and engineers to take already existing technologies and create more ideas for good. Nearly 2 million people die every year because of indoor air pollution, and Tim's team created a ventilation system that can be adapted to different homes, climates, and cultures while still being inexpensive to manufacture. To accurately test the system, they built a wooden hut and used the new system while they cooked over a fire inside. The Prius solar panel is on top of the hut. They tested the air quality while they cooked, and the results were amazing -- the ventilation system made a life-saving difference in the number of particulates in the air. Most of the electricity generating exercise equipment that we see comes in the form of cardio machines. But to make 20-year-old Birken Schimpff's idea of the power plant gym a reality, the team went a different route. They bought a weight machine, but left the weights off when they built it. Instead, they attached a bicycle wheel to change the vertical motion into a circular motion able to capture the energy. They custom made a circuit board for the machine. They also custom made an adjustable handle to change the resistance. While the system could not power the lights in the gym, it could be used to power things the person on the machine uses while they work out -- like the TV or their iPod. Here you can see the machine powering the little blue LED lights in the orange box. Another design that has real potential to hit the market is the better bike helmet, concocted by Stu Selthun. Stu's team didn't create a new bike helmet in three days, but they did design a data collecting device that could pave the way for a better bike helmet. Josh Schapiro, a CMU professor that worked with Deeplocal, created a small data collector with two circuit boards and five different sensors that measure different types of acceleration and force. They attached the sensor pack to a helmet and did a variety of drop tests with a pulley system, then compared that data to data that Dr. Stitzel had run through Toyota's T.H.U.M.S. software. The idea behind the pack is that it could be manufactured and sold to bikers, who could attach it to their own helmets. If they crash, the sensor would blink or send information to their phone letting them know whether or not they need to go to the hospital. Then the data collected from these real-life crashes could be used to design a better bike helmet. Deeplocal wrote a custom software to visualize the data collected during the drop tests. 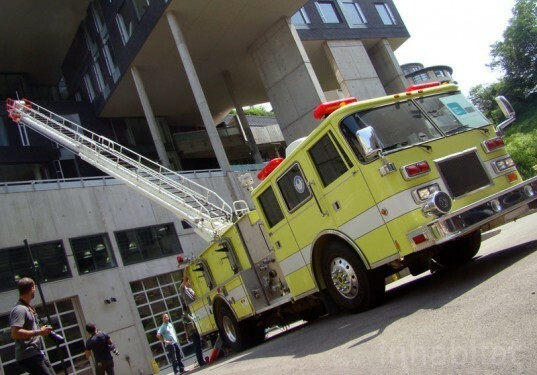 Another really exciting project, perhaps because there was a firetruck involved, was the creation of a sensor box that would help firefighters more accurately position ladders and better inform them of the conditions of a burning building. Deeplocal custom designed and built the box using some sensors similar to those in Toyota's advanced parking guidance system. Fran Orzech came up with the idea, and he worked with Deeplocal to design a product that would allow firemen to know things like the temperature, the levels of a variety of toxins, and proximity to the building without having to send someone up the ladder. Here, Shawn Sims of Deeplocal attaches the box to the firetruck. The box is attached to the top of the firetruck ladder, and the information it collects is seen in real time on a monitor down on the firetruck. When Deeplocal first approached the Pittsburgh Fire Chief about the idea, he was skeptical. But as soon as they showed him the prototype, he said, "When can we get this on the market?" The fifth and final prototype created was a customizable touch screen keyboard, invented by David Champion. He originally came up with the idea for a curved, ergonomic keyboard. Using a system similar to Toyota's touch tracer technology, Deeplocal engineers designed an app-based system that includes a keyboard, mouse, and any other input that you might want. Two moveable touch screens were used so the user has complete control. When your hands are on the touch keyboard, a pop-up image regular QWERTY keyboard appears on your monitor showing exactly where your fingers are. All of the winning ideas, plus the other 20 finalists, now belong to CMU and, if they want, the creators can work with the university on their continued development. Toyota donated $100,000 to CMU to help the development keep going.